Moscow Does Not Believe in Tears (Russian: Москва слезам не верит; translit. Moskva slezam ne verit) is a 1980 Soviet film made by Mosfilm. It was written by Valentin Chernykh and directed by Vladimir Menshov. The leading roles were played by Vera Alentova and by Aleksey Batalov. The film won the Academy Award for Best Foreign Language Film in 1980. 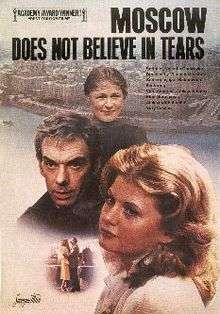 The film is set in Moscow in 1958 and 1979. The plot centers on three young women who come to Moscow from smaller towns: Katerina, Lyudmila, and Antonina. They are placed together in a workers' dormitory apartment and eventually become friends. Antonina is seeing Nikolai, a reserved but kind young man whose parents have a dacha in the country. Katerina (Vera Alentova) is a serious, upstanding woman who strives to earn her chemistry degree while working at a factory. She is asked to house-sit an apartment for her well-to-do Moscow relatives (a famous professor's family) while they are away on a trip. Lyudmila (Irina Muravyova), a flirty go-getter looking for a well-to-do husband while working at a bakery, convinces her to throw a dinner party at the apartment, and pretend that they are the daughters of Katerina's professor uncle, as a ploy to meet successful Muscovite men. At the party, Lyudmila meets Sergei, a famous hockey player, who falls in love with her and marries her even after discovering the truth about her origin. Katerina meets Rudolf (Yuri Vasilyev), a smooth talker who works as a cameraman for a television channel. He charms Katerina and then forces himself onto her. During Antonina and Nikolai's wedding, Lyudmila and Antonina find out that Katerina is pregnant. Upon discovering that Katerina is not the daughter of a professor, Rudolf refuses to marry her and believes that she is going to abort the fetus. Rudolf's mother stops by Katerina and Lyudmila's room in workers' dormitory to tell Katerina to stop bothering her son and offers her money, which Katerina refuses. Katerina finds out that it was actually Lyudmila who was calling Rudolf's mother pretending she was Katerina to demand child support. This leaves Katerina alone with the baby. The film shows Katerina, with tears in her eyes, setting her alarm clock in the dormitory room she shares with her daughter, Alexandra (subsequently played as a grown young woman by Natalya Vavilova). The film then takes a 20-year leap forward in time. Katerina is shown waking up to the sound of an alarm clock in her own apartment. She is still single, but she has gone from being a down on her luck student to becoming the executive director of a large factory. She has a lover, an older married man named Vladimir (Oleg Tabakov), but she leaves him after he shows himself to be cowardly and disrespectful. Despite her successful career, Katerina is unfulfilled and weighed down by a deep sadness. She is still close friends with Lyudmila and Antonina. By this time Sergei has quit playing hockey and become an alcoholic, and Lyudmila has divorced him and is working at a laundry. Antonina is happily married and has three children. One evening, when Katerina is returning home from Antonina's dacha in the countryside on an elektrichka train, she meets a man nicknamed Gosha (Aleksey Batalov) who flirts with her. She sees his shabby boots and dismisses him, but he persists. Gosha is a tool-and-die maker who believes that a woman must not make more money than her husband, so Katerina doesn't tell him about her position. Soon afterward they start seeing each other. As their romance begins, Rudolf unexpectedly reenters Katerina's life when he is assigned to film an interview with her to do a report on her factory's success at exceeding its production quota. He does not recognize his ex-lover at first, but when he does, he wants to make amends and meet his daughter. Katerina tells him that she does not want to see him again. Nonetheless, Rudolf shows up uninvited at her apartment when Katerina is having dinner with Gosha and Alexandra. Rudolf tells Gosha and Alexandra about the interview, and Gosha finds out that Katerina is a factory director. His pride is hurt not only because of Katerina's high position and large salary, but also because she has lied to him, and he leaves the apartment. Unable to stop him, Katerina is upset and very angry with Rudolf. In her rage, she reveals to Alexandra that Rudolf is, in fact, her father. For several days, Gosha disappears from Katerina's life. She becomes frantic. Lyudmila, Antonina, and Nikolai come to her apartment to comfort her. Nikolai gathers what little information Katerina knows about Gosha and sets out to find him, which he does. Nikolai gets drunk with Gosha, and after a heated discussion convinces him to return to Katerina. The final scene of the film is set in the kitchen of Katerina's flat. Gosha eats at the table while Katerina watches him with tears in her eyes. Gosha asks, "What's wrong?" and Katerina replies, "I have been looking for you for so long". After a moment of thought, Gosha says, "Eight days," and Katerina says "No," and then repeats, "I have been looking for you for so long," implying that Gosha is the man she has been looking for her whole life. The film won an Academy Award for Best Foreign Language Film in 1981, and was chosen to participate in the International Film Exchange. The film was nominated for the Golden Bear at the 30th Berlin International Film Festival (1980). Vera Alentova has been named as the best USSR actress according to a poll by journal "Sovetskij Ekran" (1980). In 1981 it was awarded the USSR State Prize. US President Ronald Reagan watched the film several times prior to his meetings with the President of the Soviet Union, Mikhail Gorbachev, in order to gain a better understanding of the "Russian soul". ↑ "The 53rd Academy Awards (1981) Nominees and Winners". oscars.org. Retrieved 2013-06-15. ↑ "IMDB.com: Awards for Moscow Does Not Believe in Tears". imdb.com. Retrieved 2010-08-22. ↑ Сиротоэкранное кино, Журнал «Власть» № 40 (643) от 10.10.2005. ↑ Интервью с Верой Алентовой и Владимиром Меньшовым, "В Нью-Йорке с Виктором Топаллером", RTVi.